of 1967 the western two thirds of this area are occupied by Israel. Since 2012 he lives in Hamburg, Germany. He studied Fine Arts at the Beit Beirl School of Art (HaMidrasha) in Tel Aviv, Israel. The Beit Berl College is a multi-disciplinary academic institution that focuses on education, society, art and culture. At Beit Berl education is considered an important means to foster societal change and social justice, hence Israeli jews and Arabs study side by side. 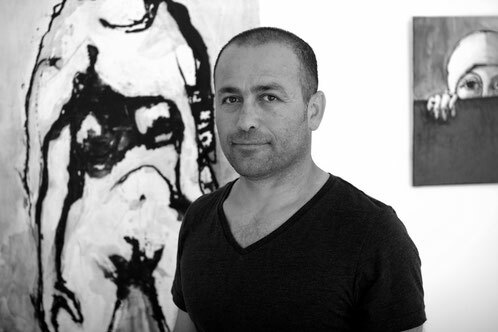 "I was born in the occupied Golan Heights in “Israel”, thus my work reflects the socio-political context in which I was born as an Arab-Syrian artist. As someone who has lived his whole life between two worlds, the question of identity is the principal question I deal with. On a daily basis my personal reality is confronted with the dilemmas of identity: On the one hand the Arab / Eastern culture which I was born in and grew up in, and on the other hand the Western culture to which I was exposed in recent years. Living on this border line is a tiring and exhausting position to be in, however, it is a challenging and inquiring situation, which often exposes me to new questions and challenges. By dealing with the question of identity I try to examine the dimensions of the conflict between these two cultures. This conflict is expressed in various forms: politically, economically and socially. On the social level I deal with the dimension of sexuality and gender within the relation between the cultures. This sexual dimension could reflect, in a sensitive and honest way, the small, hidden and yet important cultural nuances that all exist at the same time. Furthermore, I am concerned with other issues related to questions of identity such as the issue of religion and the status of women within religion; questions related to political, national and ethnic backgrounds, behavioural patterns and all the different cultural characteristics and codes by which human groups are defined, either on an individual level or in relation between the group and the other. Art for me is not a game. It is part of my reality and my life, it reflects reality in a sophisticated, sensitive and aesthetic way. Talent is the degree of ability to express what occupies my thoughts, feelings and mind. In my work I often apply black humor or stinging irony to evoke feelings of amusement and sadness at the same time. My principal media are painting and video art, however, in my work I am not loyal to either one of these styles or techniques. I always try to explore different styles, techniques and media. Nevertheless, there is always a hidden or manifested connecting line in my work: The crossing of different media and techniques reflects my own crossing between the various physical worlds I live in. There is always a place of interrogation and search in my art, a position of uncertainty."